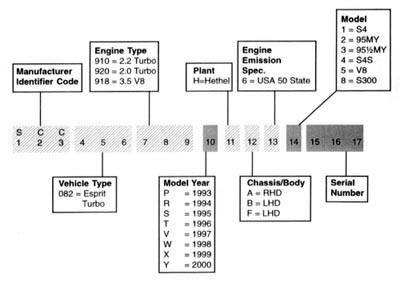 There are three variations of the VIN; prior to '98 M.Y. there is one for domestic and non-USA export markets, which complies with European Economic Community (EEC) directives; and one for the USA which complies with requirements laid down by the National Highway Traffic Safety Association (NHTSA). From '98 M.Y. - On, a common coding is used. The following charts explain how to decode these 3 different VIN styles. In 1998, Lotus consolidated the VINs for USA and Non-USA cars. 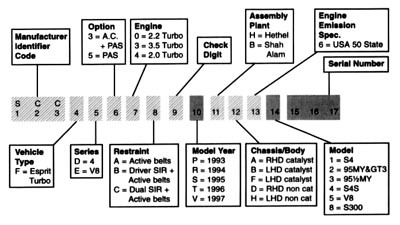 This chart shows the coding to be used for 1998MY- On Esprits. 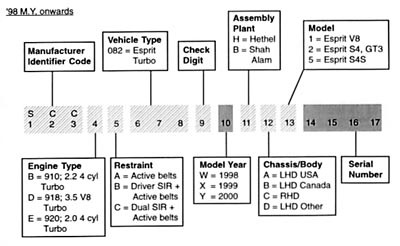 This chart shows the engine coding for Esprits.